Some brand spanking new Hembeck art to share with you today! And looky there--Spider-Man's sweet on Spiderwoman! Y'know, not only will I share these illos with you, but should you be so inclined, I'll even SELL 'em to you! Yup, friends, we're talkin' eBay! Here's access to the listings: the Avengers, the Doctors, the Spiders. 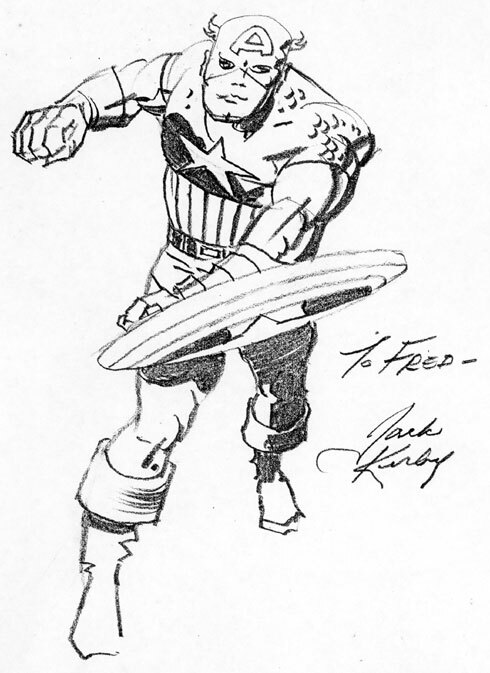 Jack Kirby would've been ninety years old today. I only had the privilege of meeting Jack (and Roz) once--I wrote up the encounter several years back, and you can read about it by going here--but at the time, he was nice enough to gift me with the specially done drawing seen above. Of course, I've scanned it in from a clear, crisp copy 'cuz the original is framed and hangs proudly on my wall, but you get the idea. We still miss you, King. There was one television show that every member of the Hembeck clan watched faithfully over its entire seven year run--The WB's (and later, The CW's) "Gilmore Girls". 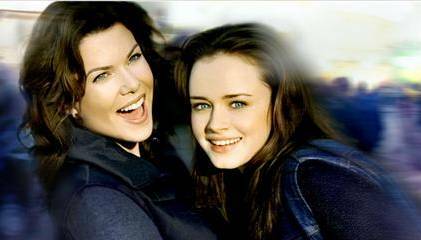 Daughter Julie was particularly enamored with the ongoing misadventures of the offbeat mother/daughter team, Lorelai and Rory Gilmore (played appealingly by Lauren Graham and Alexis Bledel), and was pretty bummed when the show's demise was announced last spring. Because of Julie's heavy school commitments when originally broadcast in May, the three of us didn't have a chance to sit down and watch the series finale until early in June. It was a satisfying--if bittersweet--ending to a unique series, and when the screen went dark and the final credits ran, Julie turned to me and asked, "Just when the heck are you going to break down and buy some "Gilmore Girls"DVDs?" She then went on to point out that there were more than a few sets of TV show DVDs languishing out in the front room, many still in their shrink wrap, blatantly unwatched. If I were to purchase some "Gilmore Girls" DVDs, Julie assured me, they WOULD be watched! Well, I'd head this little speech before, but in the sentimental glow of viewing the show's last episode, I broke down and promised her that I'd go out and buy season one the very next day--and if she didn't believe me, she could come along to make sure I was good to my word! So, the following day, we stopped over at Best Buy, my DVD source of choice. Trouble was, there were no first week discounts or the likes--Season One was going for around fifty five bucks. I was willing to pony up, however reluctantly, but first, I thought, let's take a peek downstairs at Target--sometimes they have special sales. Good move! They were offering the first season--AND the second, third, fourth, fifth, and sixth! !--all for $19.99 each! Well, what are you gonna do when faced with a bargain like THAT? What else--buy 'em all!! And to justify saving all that money by spending all that money? Simple--call it a birthday present! True to her word, Julie began an intense regimen of rewatching, beginning with a second look at the debut episode a mere twenty four hours after having viewed the final one. Lynn kept up with us for awhile, but eventually, not being the hardened tuber that we are (a point of pride, the missus likes to say) Julie and I pulled way ahead of her. If the kid hadn't gone off to MICA for a month long program, we'd surely be much farther along, but as it is, we already have two entire seasons under our belts. At least one show a day, usually two, and sometimes even three! Funny thing happened last Monday. After watching our daily wake-up episode, Julie and I set out for the local community college where Julie's gonna start an introductory night course in Physics next week. When we arrived at the book store to pick up the course's text, it turned out that the computers were down, so they couldn't accept my credit card, only cash. Guess what? I didn't have the $150 needed in pocket change, so off we went to run some other errands, with an additional stop at the bank belatedly added to the list. So, about an hour and half later, we found ourselves back in the bookstore, this time with the funds necessary to purchase Julie's Physics book. Now, please understand, while I'm always polite and pleasant to sales people, I hardly ever engage in small talk with strangers.This day was different, however--I'd already chatted up a student during an elevator ride--and as I approached the cashier (who had earlier put our book aside in case we returned later that day), she saw us coming, and reached for the text. "Yup. we knocked over a liquor store, so now we can pay for the book!" After a little more bantering, we left. Once outside, Julie looked at me incredulously. "'Knocked over a liquor store"? Who do you think you are? Lorelai Gilmore?" Believe me, the quality of my wisecracks didn't even come close to the ones spouted by Lauren Graham's character, but I could see what she meant--y'know, maybe we HAVE been watching these things a bit TOO intently. But its not likely we're gonna stop, not anytime soon anyway. Cuz today, if we can manage to squeeze it in, we'll bust open season three and watch the sets first episode. That'd be pretty appropriate for any number of reasons, not the least of which is that today is actually--ta da!--Julie's 17th birthday! Not only that, but storywise, this is the season featuring Rory Gilmore's senior year of high school, with much time also spent applying to college. A few short weeks from now, daughter Julie will find her self in the exact same situation. So, Happy Birthday Julie! When next August 25th roles around, most likely you won't even be here, but instead be off to a University yet to be determined, so I'm enjoying your presence (as well as your presents) while I can--even though I can't quite believe that you're seventeen years old! 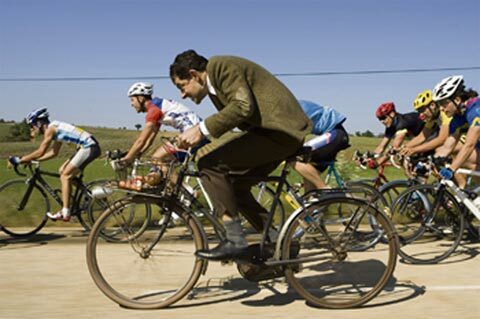 Julie and I just returned from a matinee performance of "Mr. Bean's Holiday", which opened today. inasmuch as I recently went on record as stating that 1997's "Bean" made me laugh out loud more consistently AND convulsively--even during a pair of repeat viewings--than any other movie in cinematic history, well, I had pretty high hopes for this belated follow-up. And look---I pretty much HAD to take my still barely sixteen year old daughter to see this G-rated flick today, because after tomorrow, it's most likely gonna be R-rated all the way for her(and if she could just find an NC-17 classic to take in, she'd be even more thrilled!...). That's right friends, today we celebrate the anniversary of the earth-bound arrival of embellisher extraordinaire, Mr. Terry Austin!! Now, to commemorate this noteworthy yet annual event, we could've simply taken the easy way out and posted one of any number of classic covers the award winning inker has graced with his crisp and sure line over the past several decades--you know 'em all: X-MEN, DETECTIVE COMICS, CAMELOT 3000, DR. STRANGE, FANTASTIC FOUR ROAST--but what's the fun in that? Instead, we've chosen to spotlight Mr.A's ever so brief but nonetheless brightly shining moment as a still photo thespian! 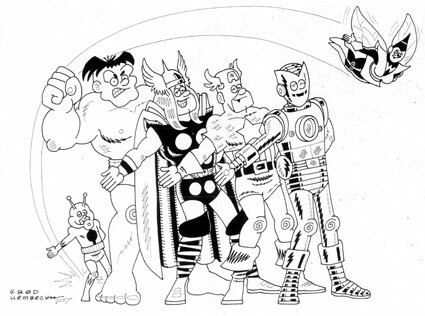 Seen above trapped inside the corner box of the cover of 1983's one and only issue of THE MARVEL FUMETTI BOOK, the embellisher's emoting gives one only a tiny tantalizing glimpse of the two page, one man tour de farce found inside, Terry's memorably entiltled star-turn, "Inker-Dinker-Doo"! And who knows? Maybe NEXT August 23rd, I'll post that entire little epic!! Happy Birthday, pal! And need I say, may you chalk up many, many more! A few days back, over on my MySpace page, one of my most frequent correspondents, the estimable Ellen Amy, left the following comment under one of the several actual photos of yours truly posted there.. I just saw a guy on the train this morning who looked almost like you, but completely clean-shaven. 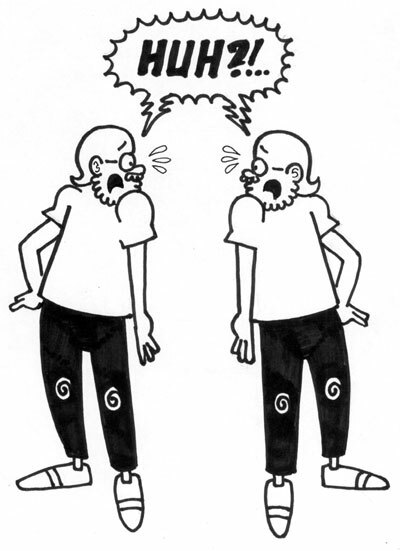 You don't have a doppelganger with an aversion to facial hair, do you? 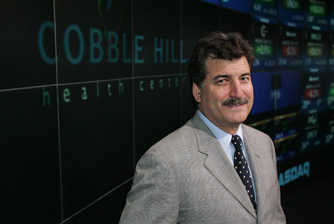 I was attending college at SUNY Farmingdale on Long Island and still living at home. I had driven off to nearby Smithhaven mall and was doing some rare--but no doubt necessary--clothes shopping on my lonesome. While things weren't quite up to Christmas season levels, the place was hopping with patrons swarming throughout. There I was, looking over the latest in hip attire in one of those little single aisle establishments--y'know, the kind with the wide open entrance way that looks directly out into the center of the mall? As I stood there, mulling over the suitability of the shirts at hand, I glanced up momentarily towards the bustling crowd passing by outside. What I saw made my blood run cold. Yup, there was a guy out there who looked exactly like me! And almost immediately after spying my double, he noticed me as well, and for a mind-numbingly long split-second, our eyes locked! I don't know what the expression on MY face was, but my twin clearly looked shocked--and not in a good way, either! Afraid of somehow being turned to stone if I stared too long--the guy didn't exactly have snakes coming out of his noggin, but still, who wants to take any chances?--I quickly turned away. By the time I looked back up, he was gone, and I never saw him again. I never forgot him, though--something that unsettling doesn't fade easily from your memory, trust me. I've always kinda wondered whatever happened to him, and now finally, thanks to Ellen Amy's keen eye, I know! He's commuting in from Long Island to Manhattan--AND he owns a razor! Truth to tell, the last time I saw him way back in those pre-beard days, so did I. This is a baseball story, but trust me friends, you don't have to be a sports fan to enjoy the punchline! Yesterday, the New York Mets were playing the Washington Nationals at DC's RFK Stadium. Pitching for the Mets was Orlando "El Duque" Hernandez, who, in the words of play-by-play announcer Gary Cohen, was "the best 7-4 pitcher in the majors". Y'see, El Duque had already suffered nine no-decisions this season, games in which he generally threw the ball well for six or seven innings, only to leave the game with the score tied either 0-0, 1-1, or 2-2, with the ultimate win or loss (and mostly, it was wins) going to a late-inning relief specialist. Sunday afternoon, history was once again repeating itself: after throwing his last pitch in the bottom of the seventh, Hernandez left the game knotted in a 2-2 tie. Unless the Mets made some hay in the top of the eighth, another fine effort by the ageless Cuban refugee would again go unrewarded. Both Cohen and his color commentator colleague--former Mets legend (and noted "Seinfeld" guest star) Keith Hernadez (no relation to Orlando) bemoaned the seemingly luckless hurler's sad situation. And then, the Mets broke out! The offense put four up on the board as they took their turn at bat in the eighth, giving the Mets a comfortable 6-2 lead. "Well, El Duque's got a little bulge now, doesn't he?..." Y'know, I absolutely love listening to Keith Hernadez! Whether he's talking about the finer points of the game at hand, or his jaunt with Cohen on the DC subway line the night before, or even his fascination with American history (I can't wait until he brings up The Battle of the Bulge! ), the man is relentlessly entertaining--and even more so when he clearly doesn't mean to be!! For more on Keith, here's a really interesting article about the Gold Glove first baseman--and first class yakker!. Yesterday, we took a bit of a jaunt--a six hour round trip--on up to Binghamton, N. Y. to participate in a tour of the University (the third such expedition made on Julie's behalf in the last eight days--but likely the last one for at least the next several weeks). Nice school. Big. And to hear their rep tell it, quite the academic jewel. But here's the part you folks may find interesting: at one point, the names of some of Binghamton's most celebrated alums flashed during the slide show. 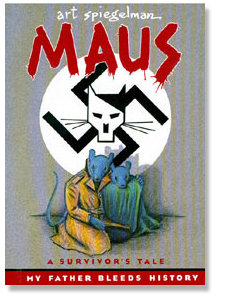 One that caught my attention: Art Spiegelman. Which made me think but one thing: "Just what kind of Mickey Maus institution IS this anyway?..." 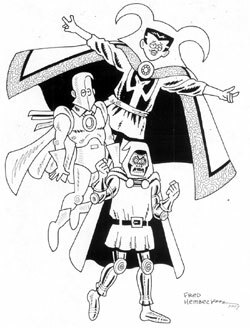 Back in those halcyon days when I was doing a monthly feature for MARVEL AGE magazine, one of my favorite comedic foils for the feature was Brother Voodoo (as to the reasons WHY I thought goofing on this quasi-dignified character was a good idea, you can read my mealy-mouthed explanation by going here). Somehow, though, I never quite took advantage of the "brother" aspect--while the flesh and blood Jericho Drumm was always in the picture, I pretty much routinely ignored his ghostly sibling, Daniel. Too bad--there's surely gotta be a whole lotta potential yocks to be mined in THAT situation! Maybe someday I'll do a strip along those lines, but for now, I've done up a brand new illo spotlighting the Voodoo Brothers! That's merely a small detail of same up above, and if you want to see the whole thing, go here! And if you REALLY like the drawing, well, by now, it'll probably come as no surprise that it's currently up for sale on eBay! Back in the summer of '77, I was visiting Lynn in Woodstock, staying at her folks house that particular week. We went to see one of her old high school buddies, Linda, over on the other side of town that day. The two of them had been pretty close, and would continue to see each other intermittently over the next several decades, but to this day, my most specific memory of Linda came that afternoon when we trudged up the stairs to her small attic apartment. "Did you hear the news? 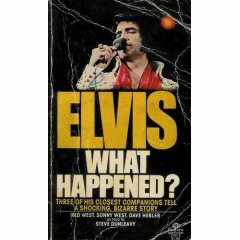 ", she asked, and before we had a chance to reply, she told us: " Elvis Presley is dead." She wasn't an Elvis fan, not really, but still, Linda had a mildly stunned look on her face. I suppose I did too. It was hard not to--even though we really shouldn't have been all that surprised. Shortly after posting the entry below, I was stunned and saddened to read on the Internet of Mike Wieringo's untimely passing. While I never actually had the pleasure of meeting Mike, I've known his long-time collaborator, Todd Dezago, for many years, and he always--ALWAYS--spoke glowingly of his creative co-conspirator. And why not? Mike's work--whether of THE FLASH, IMPULSE, SENSATIONAL SPIDER-MAN, FANTASTIC FOUR, or TELLOS--was always a joy to behold. I'll admit to not being as up to date on a lot of the newer illustrators that have come into the field in recent times, but I certainly knew Mike's stuff and consistently enjoyed it. To leave us at the age of 44 is a tragedy on so many different levels. My heart-felt condolences go out to his family, his friends, and his many, many fans--amongst whose number I've counted myself ever since I first came across Mike Wieringo's delightful drawings. I'm currently re-reading for the umpteenth time--but for the first time in at least two decades--my favorite super-hero stories ever in the recently released AMAZING SPIDER-MAN OMNIBUS. Besides the stunning quality of the tales themselves--courtesy of Stan Lee and Steve Ditko, natch--these new Omnibus compendiums greatly enhance the experience of reliving Marvel's earliest glory days by including each reprinted issue's original letters page. 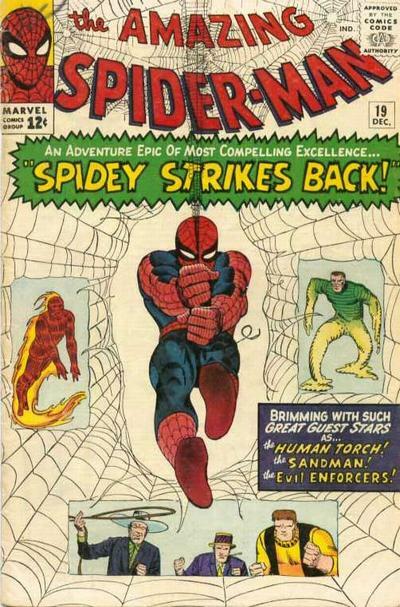 Well, last night I had the pleasure of once again witnessing the so-called "End of Spider-Man", but unfortunately didn't quite have the time to get to the two-fisted follow-up, "Spidey Strike Back", until this morning (that'd be issues 18 and 19 from late 1964, friends). "Did we tell you about sunny Stan's day at college? He was invited to speak about Marvel Comics by the Science Club at Bard College, at Annandale, New York on June 5th! Our smilin' script-whiz was flying when he came back! He said it was one of the greatest days he ever spent! The gang at Bard were bright, beaming, and barrels of fun--they tossed questions at him about every phase of comic magazines, and their interest, courtesy, and enthusiasm were as heart-warming as one of Aunt May's apple pies!, So, a great big "Thanks a mil!" to the wonderful staff and students of Bard College--and when are you gonna send the diploma?" I can't say for sure, but given that we're talking June 5th, 1964 here--and just the way the above piece was written--Stan's little lecture at Bard may well've been the very first of the by now several thousand such speeches he's given over the years, a factoid long lost in the bowels of my memory--until I stumbled across it mere hours before I was planning to call the very self-same Bard College to arrange a visit for the Hembecks myself! Oh well, at least I know WHO to go to for a snappy reference if Julie ever decides Bard is the place for her (you hear me, Professor Stan?...)! 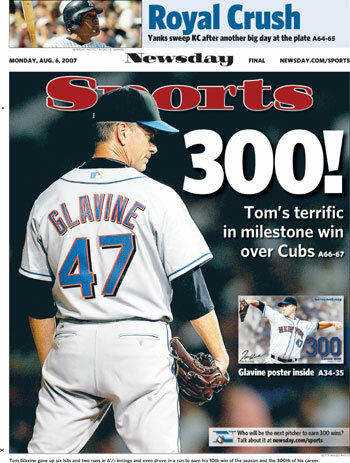 Yeah, I know: when the day comes--and it will--Tom Glavine's going into the Baseball Hall Of Fame as an Atlanta Brave. And why not? Of the 300 games he's already won in his Cooperstown bound career, a mere 58 have come in a Mets uniform. But last night, he became the first pitcher ever (and the 23rd overall) to achieve that lofty mark wearing the Blue and the Orange! So a tip of the NY cap to a Tom that may not be OUR very own Tom Terrific (that'd be Seaver, friends), but one who is nonetheless still pretty darn swell! 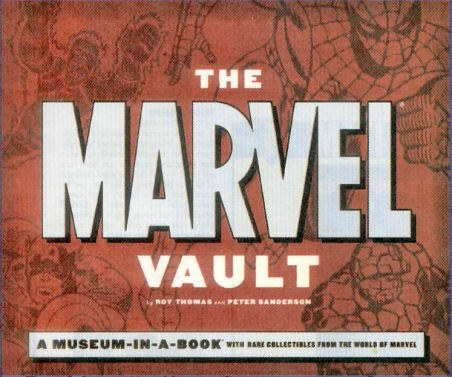 Written by the hard-to-top team of Roy Thomas and Peter Sanderson, this tome surveys the entire history of Marvel Comics not only via an informed text and well-chosen images, but via some nifty inserts as well: replicas of various M.M.M.S. paraphernalia, Bullpen Christmas cards, convention booklets, and even a campaign button for a certain past presidential candidate! A quick flip through is all you need do to realize there's lotsa good stuff to be found in here! Truth is, that's all I've been able to give the book so far--a quick peek. But I already know what my absolute favorite part of this collection is--and I guarantee that, not another person out there reading this (and all the many, many multitudes that aren't), not a single person amongst you will identify the very same thing as your favorite that I did! What exactly am I talking about, you may well ask (and if you've read this far, you certainly may as well...)? You read that right--Julie Hembeck, my darlin' daughter! But HOW, you ask (gee, you people sure are nosy...)? It's simple actually--my buddy, the estimable Peter Sanderson, apparently didn't have a suitable--or current--mug shot available for the author's bio page, so he requested the use of a pic Julie snapped of him during the 2006 MoCCA Art Festival (and which was posted along with plenty of other photos from said event right here--click to view). Thanks for asking Peter (and folks--bear in mind, Mr. S's thought provoking weekly Comics In Context column can be found here! Always an illuminating read--even when Sun Boy ISN'T his subject de jour....)! 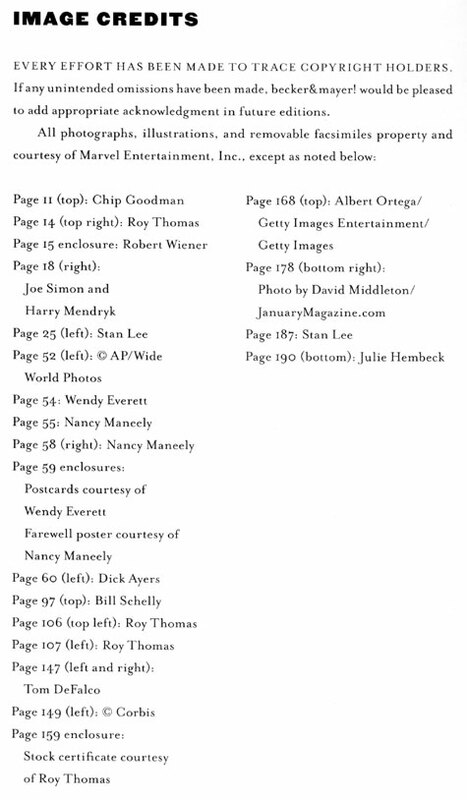 Okay, okay--so it amount's to little more than a footnote on a footnote. And yeah, the elder Hembeck is way more excited about all this than the younger Hembeck--but pardon me, okay? 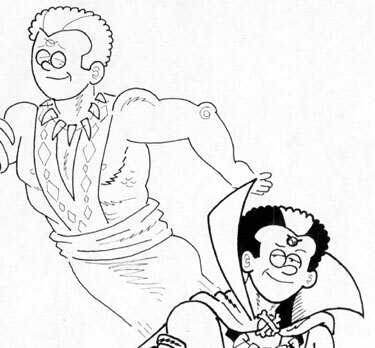 I just think it's cool that as of now (and forevermore) there are TWO Hembecks lurking in the minutia of the Marvel Archives! This may well be a first AND a last in that particular category, so excuse me for relishing the moment, all right? My parental pride is showing, I know.